Storm King Mountain is one of my favorite mountains in the area. Its dramatic landscape and sweeping views are outstanding. This was a picture perfect autumn day - the trees had just started changing color, and there was not a cloud in the deep blue sky. Rarely have I seen a day with such exceptional visibility. The Catskill Mountains were beatifully visible despite being many miles distant. I had left an umbrella in West Point a few weeks prior so that is why I decided to hike Storm King, so I can pick up the umbrella as West Point is on the Way to Storm King. Before I describe the trail route, I will take this liberty to maledict the cruel and nefarious map makers of 3rd Edition (2000) of the West Hudson Trail. The trail listing is extremely poor and its accuracy is just awful. Shame on you!! I have heard the new edition is much improved, so on my next availability will purchase the updated maps. I started at the main parking area on Route 9W, opposite Butter Hill, and headed up the Stillwell Trail. Climbed up this short but good climb to the top of Butter Hill, which offers stunning views of the Crow's Nest and the south. 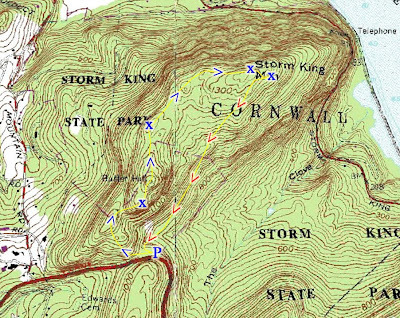 Continued along trail past the view along to the west with Schunnemunk, and then along the northern ridge of Storm King with its outstanding viewpoints of Cornwall, Newburgh, the Hudson River, and Beacon Mountain. From there took the By Pass Trail, and then took the unmarked trail past the end of the Bypass Trail back to the trailhead. At the Trailhead looking east to the Storm King Summit. Breakneck Ridge is in the distance across the river. The summit of Butter Hill from the trailhead. Looking down at Route 9W over the Crow's Nest. Facing South from atop the summit of Butter Hill. Facing north at the Hudson Valley at the view past Butter Hill. view the migratory patterns of the birds. Facing northwest. The Catskills and Gunks are in the far distance. At the north view near the summit. Newburgh from the summit. Facing northeast. Cornwall and the Hudson Valley, with Gunks in distance. Facing south from the south summit view. Facing south at the Crow's Nest. Me at the south summit view. I'm finding your site to be very helpful as I plan my first hike for this weekend. 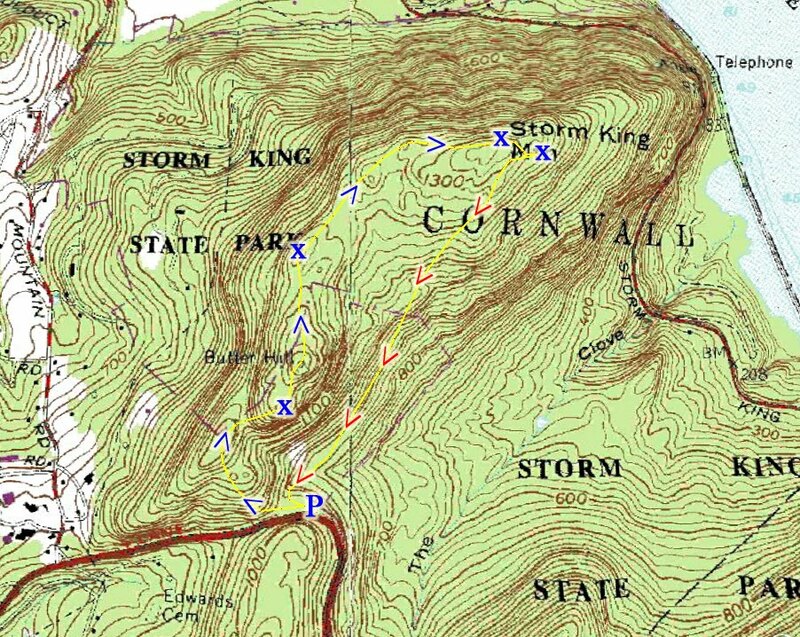 I'm wondering if you think the Storm King Mtn hike is do-able without a trail map? Do you recommend it for a beginner hiker (who does walk a lot & is in decent shape)? I am looking for a hike with great views that won't be as crowded as what I've read Bear Mountain is. Thanks! Thank you. Storm King is definitely a doable hike. If its your first time and you don't have a map, just go to the top of Butter Hill and that's it. Butter Hill on Storm King is a a good short hike for beginners and you likely won't get lost getting there. Its always best to start with someone experienced or with a map so you know where you are going. Great, thank you Heshy!! So happy for your quick response :) I actually secured a map from a friend last night a bit randomly, and am excited to check it out!! We will try out Butter Hill, and maybe go out onto the Bypass trail once we get there, get oriented with the map and start hiking. I'm really enjoying your blog. Thanks again!